The Burgess Optical Tiny Titan II is a small parallelogram suitable for binoculars that weigh up to 3 pounds, which includes binos up to 15x70, possibly even 20x80 if the lightweight variety. The Tiny Titan II allows easy adjustment of the binocular height, both for sharing the binoculars with others and for maintaining the same eyepiece elevation relative to ground when viewing objects at different altitudes. Terry Alford, an East Tennessee master craftsman, makes each Tiny Titan II Mount. The Tiny Titan II is shipped without a counterweight. To keep shipping costs low, the Tiny Titan II does not include a counterweight. The ideal counterweight is either a standard 1 Kilo or 1-1/4 pound barbell weight that is available at many sporting goods stores and at Walmart. The counterweight attaches to the lower arm of the Tiny Titan II and slides in a slot to compensate for the weight of the binocular. Lighter binos require the counterweight moved towards the binos, and heavier binos require the counteweight moved away from the binos. The Tiny Titan II includes a 1/4x20 attachment that fits most binoculars. 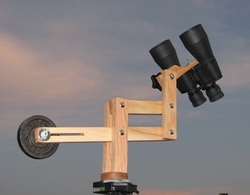 The sliding counterweight allows the Tiny Titan to be balanced for the binoculars being used. Below the bino mounting screw is the altitude adjust knob. While holding the binoculars, loosen the knob and adjust the binoculars so that they are pointing higher or lower in the sky. The Tiny Titan does not have an azimuth adjustment. It must be used in conjunction with a tripod with an azimuth head, such as a photo tripod with either a pan head or a three-way head. The Tiny Titan II is available in various configurations. It is available fully assembled, ready to install on a tripod. It is also available as a kit. The kit includes all pieces necessary to assemble a complete Tiny Titan II. The critical holes are pre-drilled and some drilling of 1/4" holes is required. The wooden pieces do not have a finish or sealant.